Land Use: partly zoned for Medium Impact Industry, Rural Residential, cropping and grazing. This property has 4 titles. It has a 4 bedroom farm house, sheds, cattle yards, excellent fencing, ample water and outstanding black soils. As an investment farming opportunity, the Medium Impact Industry Zone passes through the northern titles, parallel to Gap Road and the Rural Residential Zoned area faces Clifton Road, on the west side of the property. 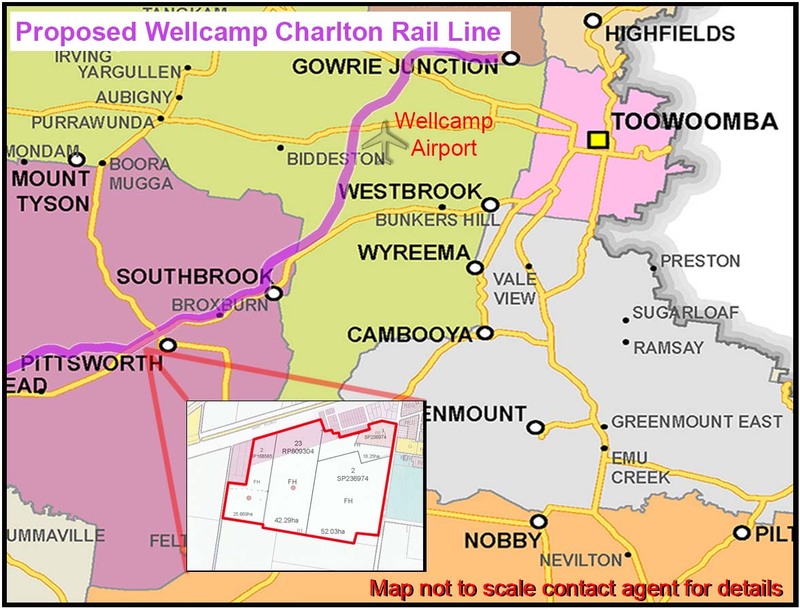 The proposed Wellcamp Charlton Rail Line section of the Inland Railway System passes next to the property, providing the prospect of rail transport. Merely 30 minutes away is the new Toowoomba Airport which already flies the area’s produce internationally. Farming the land, which is not zoned for any of the above, gives the farmer the choice of cropping or grazing on the rich black soils. Currently, the land is used for growing oats for hay, grazing for beef cattle and raising thoroughbred horses. There is a comfortable four bedroom home and farm sheds that are currently rented out. The town of Pittsworth is the heart of the Darling Downs and is the service centre for the region. Pittsworth has a large modern shopping centre, state primary and high schools, medical, dental and veterinary surgeries, restaurants, a golf course, retirement village and more. The town has a population of just under 6,000. Pittsworth is famous for its western riding centre and rodeos. The thoroughbred racing people use the Bahran Training Centre, located in Westbrook, only 10 minutes away. It is a thriving country region. Pittsworth’s proximity to Toowoomba provides affordable housing for those who commute daily. With the railway and airport so close, several large-scale enterprises have already established themselves next to this property. The property presents very well as a dual business investment farming opportunity for the astute buyer.